Yemeni Ex-President Ali Abdullah Saleh Killed In Houthi Attack : The Two-Way Saleh, who led Yemen for over three decades before resigning several years ago, had been allied with Houthi rebels against a Saudi-led coalition — until that pact appeared to fracture in recent days. A Houthi rebel fighter stands atop a cannon-mounted truck in front of the Sanaa residence of former Yemeni President Ali Abdullah Saleh. Houthi rebels killed him in an attack Monday, and video purporting to show his corpse circulated on social media. Ali Abdullah Saleh, the former Yemeni president who spent more than three decades in power before he stepped down in 2012, was killed after violence consumed the country's capital over the weekend. A member of Saleh's own party told NPR that Saleh had died, even as graphic video purporting to show his body circulated on social media Monday. Houthi rebels, Saleh's erstwhile allies, ambushed and killed him during a rocket-propelled grenade attack on his vehicle as he tried to leave Sanaa. NPR's Ruth Sherlock describes the images recorded in the attack's aftermath: "Houthi rebels shove his bloodied corpse onto the back of a pickup truck. They cheer and thank God over and over. They seem almost incredulous that he is dead in their hands." Until recently, the Iran-backed Houthis observed an uneasy pact with Saleh's supporters — united against both Saleh's successor, Abdrabbuh Mansur Hadi, as well as the Saudi-led coalition that has backed Hadi with an airstrike campaign since 2015. But that tenuous alliance snapped in recent days after Saleh made gestures of reconciliation toward the Saudis, a move the Houthis called "a coup against our alliance and partnership." "The Sanaa street fighting seems to have split the capital in two parts, with the northern part under the Houthis and the southern under Saleh's fighters. "Both sides have set up checkpoints, placed snipers on rooftops and sealed off entrances to the city, which slowed down street movement and traffic. Bombings and sporadic barrage of gunfire rocked the southern part of Sanaa on Sunday." 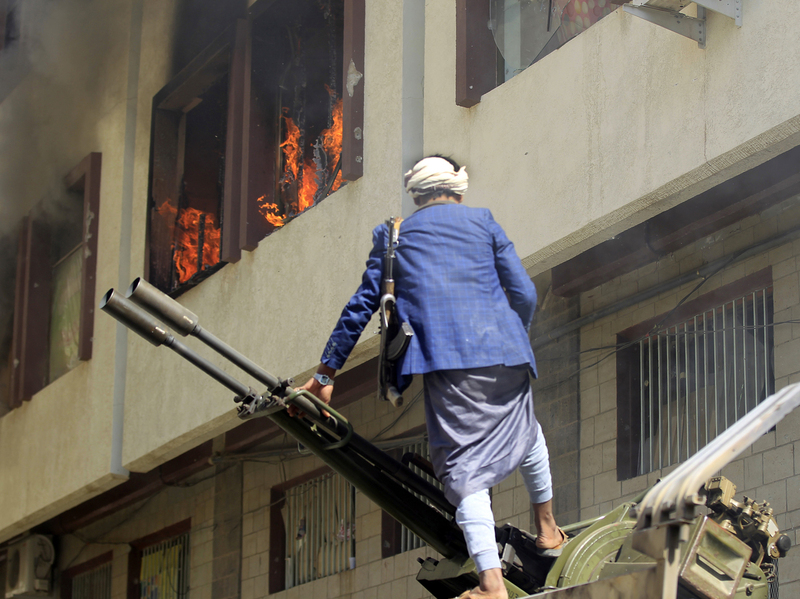 By Tuesday, it appeared the Houthis had consolidated power in the capital. They celebrated Saleh's death as a significant victory amid the fighting. For that reason, Monday marked a "historic, exceptional and great day in which the conspiracy of betrayal and treason failed, this black day for the forces of the aggression," said Houthi leader Abdul Malik al-Houthi, according to Reuters. It likely also marks a further slide deeper into the violent chaos that has engulfed Yemen for years and — in the words of three major international aid agencies — turned it into "the worst humanitarian crisis in the world." Amid the civil war fought by Saleh and the Houthis against Hadi's internationally recognized government and the Saudi coalition supporting him, more than 20 million civilians in Yemen now need urgent humanitarian aid — including more than 900,000 who are believed to have contracted cholera. A weeks-long Saudi blockade of Yemen's major points of entry — implemented last month in retaliation for an attempted Houthi missile strike on Riyadh — did nothing to help the crisis before that blockade was eased last week. In many ways, Saleh's death also marks the end of an era for Yemen. For years, he led Northern Yemen, back when the country was divided in two. And he was the first president under a newly unified Yemen in 1990. It was not until late 2011, in the midst of the Arab Spring, that Saleh finally bowed to public pressure and agreed to leave office under a transfer-of-power agreement. "He wasn't the classic dictator who ruled with the iron fist," Greg Johnsen, a Yemen scholar, told NPR's Soraya Sarhaddi Nelson. "He did much better at sort of gauging the opposition ... and then trying to create fractures and fissures among them instead of being centered on him, rather." Many of those fractures persisted after his presidency ended. And now, the Yemen he leaves behind is also riven by the interests — and support — of competing regional rivals, the predominantly Sunni Saudis and Shiite Iran. Peter Salisbury, senior researcher for the Middle East and North Africa for the Chatham House think tank, told Ruth he expects Saleh's death to intensify a conflict that's ground to a bloody stalemate. He said that with the Houthis in control of Yemen's northwest, right on the Saudi border, "I expect that the Saudis will take the gloves off in the way they fight the war." For a war that has already left more than 10,000 people dead, any escalation on either side would prove significant. At the same time, Salisbury said it remains unclear exactly what's to come. "Anyone who makes solid predictions about who's going to step in what's going to happen next, I think it is speaking to too soon," he said. "But what I can say with a relative degree of assurance is that the possibility of a peaceful resolution to the conflict in the near future looks looks increasingly unlikely." Johnsen echoed that assessment in a tweet Monday. "A lot of people are about to tell you what's about to happen in Yemen," Johnsen wrote. "The truth is no one knows. But it looks very dark."